I have been raising goats for most of my life…10 years to be exact. I have always loved goats ever since I can remember, and the last 10 years has only increased my love and enthusiasm for these wonderful animals. I was taking care of my mother’s herd of goats when I was about 7 years old, doing hoof-trimming, milking, and pulling kids when needed. When I was 13 years old, my younger sister and I purchased our own goats with our personal savings. Those first two milk goats that we got were the start of our herd of now over 20 dairy, meat, and fiber goats. You may be wondering “why goats?” After all, I could have chosen to raise a multitude of other animals instead. What makes goats so amazing that I would dedicate 10 years of my life to these animals? You may be surprised to find out that my reason can be explained simply in the 4-H clover. Yes, I am talking about the Head, Heart, Hands, and Health H’s of 4-H, and although you may have never thought that the 4-H clover had anything remotely to do with goats, by the end, I think you will agree that these four H’s are all about goats. While some of my goats may be a little hard-headed, I hope that you are not. By using your head, I think you will see that if you are considering a type of livestock to raise, goats almost always will come out as the logical choice. Goats are extremely adaptable animals that thrive in many different environments and husbandry situations, making them a perfect choice for any homestead or serious farmer. They can thrive on land that sheep and cows would turn their noses up at, and utilize brush and wooded areas that would go to waste with other livestock. They don’t require elaborate housing, just a roof and 3 walls to block the wind. While fencing for goats is harder than for some other livestock, they do train well to electric fencing. On our farm, I use step-in posts with four strands of poly wire to do rotational grazing, and 6 strands of electrified wire and t-posts for permanent fields. Dairy goats are more feed efficient than dairy cows and produce just the right amount of healthy milk for a family, from about a half gallon each to nearly 2 gallons of milk a day, depending on the animal. They are also safer and easier to handle than cows due to their smaller size, which makes them a good first animal for children. Kid goats mature quickly with doelings easily kidding their first time at about one year of age. They often have twins and triplets, and we even have had one goat have quintuplets. This can quickly multiply your profits. And speaking of goat kids…that brings us the to next H on the clover which stands for heart, and seriously, who ever had the heart to turn down a baby goat!? Yes, goats and their sweet kids certainly do beat all for cuteness! And although cuteness alone is not necessarily a good reason to raise an animal, it does matter. After all, you are the one that has to look at that animal 365 days a year. So you might as well raise a cute one! They come in all sorts of colors and patterns, some flashy with spots, and some with symmetrical lines. Some even have thick white bands around their black bodies like Oreo cookies! When you go to sell your goats, buyers will often even pay more for cuteness which is an extra bonus! Raising goats gives 4-Her’s a unique way of using their hands, the third H on the clover. I will not mince words, raising goats is a LOT of hard work. Each day they must be fed and watered. They need their fences maintained and cut under and their sheds mucked out each year. If you raise dairy goats like me, they also need to be milked twice a day. Fiber goats must be shorn twice a year. You will also need to store away enough hay for winter, and take care of any goat that might get sick, protect the does and kids at birthing season, and trim their hooves and brush them regularly. You may be wondering if all that hard work is really worth it, and I would say a resounding YES!Raising goats as a 4-H project gives you many opportunities, one of which is to show your animals. Although showing is not for everyone, it is a great way to learn about conformation, and get a good opinion on the quality of your animals. Of course, the best part about showing is when you get to walk out of the ring with a blue ribbon and sometimes even a money prize. Another opportunity to use your hands is by training a working goat. I have a very special goat named Alfred, and after lots of hard work, he is now trained to drive and pack. I take Alfred out with his red wagon and we give rides to children around our neighborhood and that visit our farm. We have also entered him in two parades. The last parade that he was in, he won the Kid’s Choice Award. After the parade, we stayed for several hours and gave free rides to the children there. We have also taken a baby goat to a local nursing home to show to the residents. Just use your imagination and you can come up with some pretty amazing ways to use your hands serving your community though goats. Raising fiber goats takes using your hands to a whole new level. With angora goats producing around 8 pounds of mohair a year, you have a lot of fiber to work with. I spin, knit, crochet, felt and weave which are all ways that use my hands and my goat’s fiber. And finally, let’s remember the last H, health. Health happens to be one of the biggest reasons people raise goats. Many people that are lactose intolerant, or can’t drink cow’s milk, have no problem drinking goat’s milk. Sadly, for this reason many people think of goat’s milk just as some kind of medicine that is only good for the sick. Thankfully, that is not true at all! Goat’s milk is better for everyone. And it tastes wonderful too! Yes, you heard me right, goat’s milk tastes wonderful, and I am not speaking only for myself, my entire family loves goat’s milk. But, the health benefits of goat’s milk don’t stop in your glass. Goat’s milk is great for making cheese and yogurt. Also, many cosmetic products such as soap and lotion are made from goat’s milk and have a healthy effect on your skin. Goat meat, is another healthy product that comes from raising goats. Although goat meat is widely consumed around the world, it is often overlooked in the United States, though through no fault of its own. Goat meat is a very lean meat that is comparable to lamb in flavor and consistency. Hopefully, you now have a better understanding of why I love goats and have raised them for so many years. And maybe, just maybe, you will now consider raising this amazing animal for yourself. What could any 4-H’er want more than to raise an animal that is literally a walking 4-H clover…well not exactly, but still you can’t get much closer than a goat. After all, what other animal exemplifies all of the four H’s so perfectly. 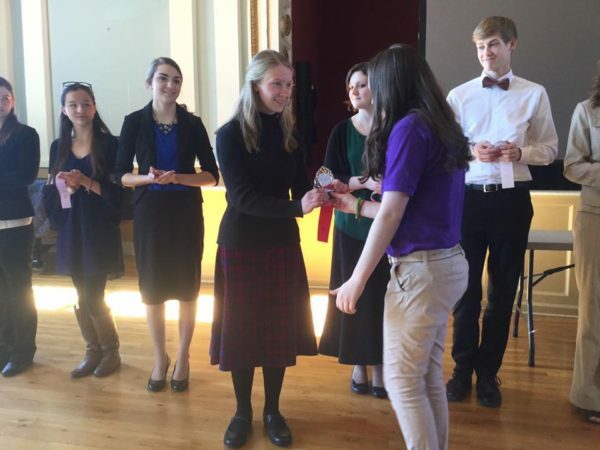 Lenore Thorne won first in Club and Second in Regionals with this speech.